Community acquired methicillin resistant Staphylococcus aureus (CA-MRSA) infection is a matter of public health concern. The incidence of community acquired Staphylococcus aureus (CA-MRSA) is rising. To date only 12 cases of CA-MRSA pericarditis and seven cases of esophageal cancer related purulent pericarditis have been reported. We here present a 54 year old woman who presented with cardiac tamponade that was noted to be purulent and in whom esophagopericardial fistula secondary to squamous cell esophageal cancer was discovered subsequently. Purulent pericardial fluid subsequently grew MRSA. Patient succumbed despite appropriate management with antibiotics. Popovich KJ, Weinstein RA, Hota B. Are community-associated methicillin-resistant Staphylococcus aureus (MRSA) strains replacing traditional nosocomial MRSA strains?. Clinical Infectious Diseases. 2008 Mar 15; 46(6):787-94. Spodick DH. Acute cardiac tamponade. American heart journal. 1991 Dec 1; 122(6): 1794. Rubin RH, Moellering Jr RC. Clinical, microbiologic and therapeutic aspects of purulent pericarditis. The American journal of medicine. 1975 Jul 1; 59(1): 68-78. Klacsmann PG, Bulkley BH, Hutchins GM. The changed spectrum of purulent pericarditis: an 86 year autopsy experience in 200 patients. The American journal of medicine. 1977 Nov 1; 63(5): 666-73. Sagristà-Sauleda J, Barrabés JA, Permanyer-Miralda G, Soler-Soler J. Purulent pericarditis: review of a 20-year experience in a general hospital. Journal of the American College of Cardiology. 1993 Nov 15; 22(6): 1661-5. Parikh SV, Memon N, Echols M, Shah J, McGuire DK, Keeley EC. Purulent pericarditis: report of 2 cases and review of the literature. Medicine. 2009 Jan 1; 88(1): 52-65. 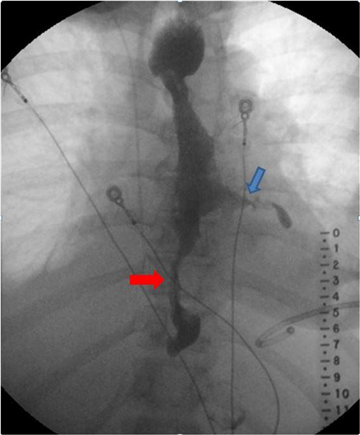 Mizuguchi Y, Takeda S, Miyashita M, Ikezaki H, Nakajima Y, Akada S, Makino H, Futami R, Arai M, Sasajima K, Tajiri T. A case of cardiac tamponade following esophageal resection. Journal of anesthesia. 2005 Aug 1; 19(3): 249-51. Furak J, Olah T, Szendrenyi V, Horvath OP, Balogh A. Esophago-pericardial fistula caused by recurrent esophageal tumor. Magyar sebeszet. 1999 Apr; 52(2): 89-91. Patel S, Maves R, Barrozo CP, Mullens F, Russell K, Truett A, Deroo T. Mycotic pseudoaneurysm and purulent pericarditis attributable to methicillin-resistant Staphylococcus aureus. Military medicine. 2006 Aug 1; 171(8): 784-7. Lee YP, Hoi WH, Wong RC. A case of myopericarditis in a patient with methicillin-resistant Staphylococcus aureus community-acquired pneumonia. Annals of the Academy of Medicine, Singapore. 2008 Mar; 37(3): 243. Shivaraju A, Luu J, Bratis C, Akhter N, Stamos T. Community-acquired MRSA pericarditis. Cardiology Review. 2008 Jan 1; 25(1): 39-43. Rozenbaum R, Sampaio MG, Batista GS, Garibaldi AM, Terra GM, Souza MJ, Vieira EN, Silva-Carvalho MC, Teixeira LA, Figueiredo AM. The first report in Brazil of severe infection caused by community-acquired methicillin-resistant Staphylococcus aureus (CA-MRSA). Brazilian journal of medical and biological research. 2009 Aug; 42(8): 756-60. Hussam MA, Ragai MF, Iman MF, Zakaria A. Community-acquired methicillin-resistant Staphylococcus aureus pericarditis presenting as cardiac tamponade. Southern medical journal. 2010 Aug; 103(8): 834-6. Arora NP, Kottam A, Mahajan N, Bhasin B, Krishnamoorthi R, Shenoy M, Afonso LC. Purulent pericardial effusion from community-acquired methicillin-resistant Staphylococcus aureus. The American journal of the medical sciences. 2012 Aug 1; 344(2): 160-2. Lutmer JE, Yates AR, Bannerman TL, Marcon MJ, Karsies TJ. Purulent pericarditis secondary to community-acquired, methicillin-resistant Staphylococcus aureus in previously healthy children. A sign of the times?. Annals of the American Thoracic Society. 2013 Jun; 10(3): 235-8. Kurahara Y, Kawaguchi T. Cardiac Tamponade with Community-acquired Methicillin-resistant Staphylococcus aureus Pericarditis. Internal Medicine. 2013; 52(15): 1753. Kumar VA, Nair N, Thachathodiyl R, Nandakumar A, Dinesh KR, Thatcher E, Karim S, Biswas R. Molecular characterization of methicillin-resistant staphylococcus aureus causing fatal purulent pericarditis. Journal of laboratory physicians. 2013 Jul; 5(2): 136. Bagavathy K, Raju SK, Joseph R, Kumar A. Cardiac tamponade complicating purulent pericarditis due to community acquired methicilin resistant Staphylococcus aureus (CA-MRSA). Connecticut medicine. 2014 Mar; 78(3): 163-5. Drake T, Goldstein D. Heart of Gold: A Case of Community-Acquired Mrsa Pericarditis with Tamponade [abstract].Journal of Hospital Medicine. 2015; 10 (suppl 2). https://www.shmabstracts.com/abstract/heart-of-gold-a-case-of-community-acquired-mrsa-pericarditis-with-tamponade/. Accessed May 18, 2018. Ben TS, Nousbaum JB, Garo B, Pouchelle C, Boles JM, Robaszkiewicz M, Gouerou H, Garre M. Purulent pericarditis revealing esophageal cancer. InAnnales de medecine interne 1992 (Vol. 143, No. 4, pp. 279-280). Muto M, Ohtsu A, Boku N, Tajiri H, Yoshida S. Streptococcus milleri infection and pericardial abscess associated with esophageal carcinoma: report of two cases. Hepato-gastroenterology. 1999; 46(27): 1782-4. Kohl O, Schäffer R, Doppl W. Purulent pericarditis as an initial manifestation of esophageal carcinoma. Deutsche medizinische Wochenschrift (1946). 1999 Apr; 124(13): 381-5. Kaufman J, Thongsuwan N, Stern E, Karmy-Jones R. Esophageal-pericardial fistula with purulent pericarditis secondary to esophageal carcinoma presenting with tamponade. The Annals of thoracic surgery. 2003 Jan 1; 75(1): 288-9. Touati GD, Carmi D, Nzomvuama A, Marticho P. Purulent pericarditis caused by malignant oesophago-pericardial fistula. European journal of cardio-thoracic surgery. 2003 Nov 1; 24(5): 847-9. Nessler B, Paradowski A, Nessler J, Libionka A, Misztal M, Latacz P, Piwowarska W, Nalepa P, Włodarczyk J, Olechnowicz H. Case report Cardiac tamponade as the first symptom of oesophageal carcinoma–a case report. Kardiologia Polska (Polish Heart Journal). 2006; 64(3): 312-5. Takayama T, Okura Y, Funakoshi K, Sato T, Ohi H, Kato T. Esophageal cancer with an esophagopericardial fistula and purulent pericarditis. Internal Medicine. 2013; 52(2): 243-7.